I can’t get enough of pug puppies. Especially this little one. The thing about puppies is they explore with their mouths, so they have to be kept under close watch at all times. …puppy teeth are equal only to shark teeth…. …seriously, girl. That can’t taste very good. 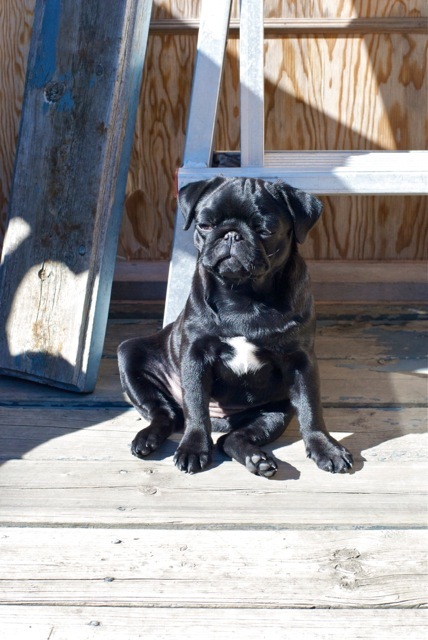 Unfazed, and sitting like a true pug princess, Jo contemplates her next snack. OMD!! What a cutie! Ma is just ‘awwwwe’ ing all over! 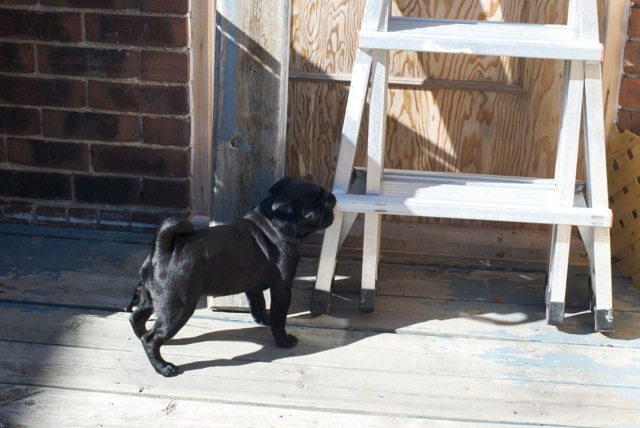 I use to chew stuffs, but I can say that I never tasted the ladder! You are a Princess Jo. Oh my gosh that last photo has me tearing up from laughter. What an offended little face. How DARE the human take her ladder away! Ah, how they learn the stink eye at such a young age. Is this your protege, Lola?